Whatever happened to winter? Rising temperatures, melting ice caps and the proliferation of carbon dioxide in the air that’s the cause of it have wrought havoc on the cold consistency of winter days. We’re warming, yes, but climate change brings with it lurches from one extreme to the next. This week was one of them. There will surely be more before the season’s done. All good reason to be anxious — even more so, sitting here at sea level here in Boston. Impending environmental armageddon may not be much fun to live with, but anxiety is the raw material for a lot of very good art. This year, a handful of nearby exhibitions embrace the looming disaster. “Nature’s Nation: American Art and the Environment,” at the Peabody Essex Museum, is a sprawling, centuries-spanning exhibition on the wonderfully diverse, spectacular and under-siege wilderness on which much of the American creation myth of self-reliance is built. 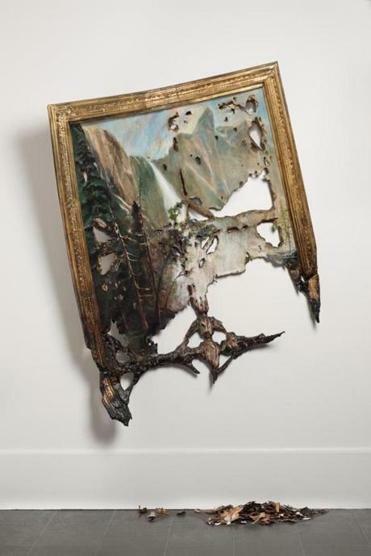 The show covers everything from the Romantic sublime to industrial decay, but the cover of the weighty tome that accompanies it says a lot about its priorities: Valerie Hegarty’s “Fallen Bierstadt,” a scorched and crumbling version of Albert Bierstadt’s idyllic mountain scene “Bridal Veil Falls,” partly collected in a heap on the floor. The show spans much more than the current crisis, engaging with the central role of the American wilderness in the construction (and deconstruction) of national identity. But Hegarty’s piece being chosen as its emblematic work says a lot, I think. It falls in line behind the Clark Art Institute’s “Extreme Nature” show in the fall, and in front of the forthcoming “Fragile Earth: The Naturalist Impulse in Contemporary Art” at the Florence Griswold Museum in Old Lyme, Conn. A preoccupation like this hardly seems a coincidence, an anxious moment moving multiple museums to worry as one. (both PEM and the Griswold feature Mark Dion, whose coolly apocalyptic pieces about preserving things lost, or about to be, help to sound the alarm). The Center for Maine Contemporary Art adds its voice: “Melt Down,” its spring offering, presents “evidence of the undeniable impact of climate change on the fragile environments of the Arctic and Antarctic.” Add in the Yale Center for British Art’s current exhibition “Before the Deluge: Apocalyptic Floodscapes from John Martin to John Goto,” and you can hear the warning bells ringing. “The fragile relationship between human civilization and the water that sustains or destroys us has perhaps never been more apparent than at the present moment,” reads a description on the Yale website. Art has always seized on anxiety-ridden moments to convey larger truths about the world. The Cold War, with its threat of nuclear annihilation, was perhaps the apex of such things — a terrifying moment that helped to produce some of the most compelling art in memory right from the start (Abstract Expressionism, at least according to Jackson Pollock, was born partly of the bomb — a compulsion to engage the apocalyptic energy now stalking the globe with an explosion of its own). It’s not too much to believe that this moment of environmental calamity carries an end-of-days urgency of its own. Too heavy a hand can push away more viewers than it draws near, so let’s look at a couple of shows that keep their environmental anxieties buried a few layers deep. Matthew Barney, whose career has been focused largely on both the examination and dismantling of masculine stereotype, drifts away from expectation in his upcoming show at his alma mater, Yale. On March 1, the Yale University Art Gallery will debut Barney’s “Redoubt,” a film piece shot in Idaho’s Sawtooth Mountains. The work “layers classical, cosmological, and American myths about humanity’s place in the natural world,” according to the gallery’s website. Right, but given Barney’s predilection for the visceral — if you saw “River of Fundament,” his six-hour epic mash-up of Egyptian mythology cross-bred with Detroit’s industrial decay, you’d know what I mean — there’s surely something here beyond the merely contemplative. Barney’s fascination with the ruins of late Modernity — overpasses and serial-killer celebrity, burnt-out foundries and death metal — have always for me held a tacit connection to the long, slow evisceration of the natural world. This definitely fits. A harder fit, at least on the surface, will be Mass MoCA’s “Mind of the Mound: Critical Mass,” a colossal accumulation built by the artist Trenton Doyle Hancock. Melding sci-fi weirdness with Greek mythology and pre-teen superhero fanaticism, Hancock will create a world all his own in the museum’s gargantuan Building 9, of suitable scale to accommodate airplane repair. Hancock’s “Mounds” are living, furry heaps that grow roots and connect to each other underground as a “rhizomatic network”; these peaceful creatures, the epitome of nature and culture in harmony, are, of course, under threat; I won’t give away the ending, but to say it’s very much on theme (as well as many others; the Mounds are multifarious things). It helps make all this very timely indeed. I wish it wasn’t.